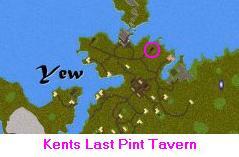 Last visited by Zerver – Feb 21 99Kents Last Pint Taver is located in one of the many unused buildings of Yew. This one is located almost due west of the Abbey, across the bay. It is within guarded city limits, but has no Vendor. So the only time to purchase anything is when Kent is there, or when someone else brings the booze and food. If you are looking for a place to hold a party, this can certainly be it. Doors can’t be locked (I don’t think anyway), and no one can kill you. Second visit found a war game between the Orcs and the Yew Townsfolk in full swing. There were a few casualties, but no on looted, and no one reported murders. I believe they also use guilds because Kents is in a guarded area, and one miss keyed macro and WHAM some one is dead. Anyway, the Orcs won (yet again from what I understand). So they posess the tavern for a time. Several Humies suggested that they would be weeks getting the smell out. I walked in and just watched and listened. At the time there was some sort of ruckus with accusations flying around. In the end, two peole walked outside followed by everyone else, armed themselves, and shot until one died. No heals, no hiding, no running around. I guess Might makes Right. But no one looted the looser. She returned and retrieved everything after about 10 minutes. Kents is still a major hangout for players of all types. After many months of visiting Kents, I know it to be a freat place to meet and socialize with fellow role players of all types.